Cat Chat With Caren And Cody: Book Review: "Plan Cee" by Hilary Grossman is "Chick Lit" at It's Finest! 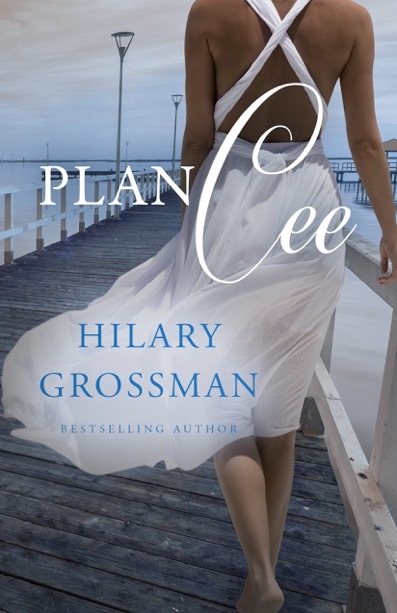 Book Review: "Plan Cee" by Hilary Grossman is "Chick Lit" at It's Finest! FROM CAT CHAT WITH CAREN AND CODY: I have the pleasure of knowing author Hilary Grossman through her blog, Feeling Beachie, and I have had the HONOR of meeting Hilary in person. Hilary's personality is warm, welcoming, funny, quirky, and many of those characteristics are evident in a number of her characters in her books. I am sure you will love her as much as so many of us do! The first full day of Spring is today and it is time to start thinking about the books you will put into your beach bag, or take along on vacation to read on the plane or poolside. Not vacationing? Don't have a pool or a beach? Neither do I, but I bet you have a comfy chair or sofa and some goodies you can munch on while you kick back, probably with a cat (or two or three) by your side, and enter Cecelia's world. Hang on my friends, it's going to be a wild ride!! I found myself saying "Noooo!!!" OUT LOUD NO LESS, at the mess Cecelia had gotten herself into. Because I have the pleasure of knowing Hilary Grossman in real life, I messaged her on Facebook, literally screaming. I can't say why I was screaming or I will give everything away!! I had the distinct honor/pleasure of reviewing both of author Hilary Grossman's previous books, (the most recent of which was Plan Bea. if you haven't read either of Hilary's previous books, you MUST!!) Hilary's writing is like chatting with a dear friend, or being nosy and peeking into their lives! "CHICK LIT" AT IT'S FINEST!! Plan Cee, as well as Hilary Grossman's previous books, have all of the necessary components of books that are classified as "Chick Lit." *****The really good chick lit books are by authors who haven't forgotten that lit stands for literature, and they manage to create complex stories with subtle characters and universal themes. And - here's the truly difficult part - they do so while employing the conventions that chick lit readers have come to love and expect. Fingers crossed there will be!! *****quoted from Chick Lit, Which Comes First, the Chick or the Lit?" This sounds like a good book - Mimi will look fur it. HAPPY SPRING CODY MY MAN!!!! Wheeeeeee! THANK YOU, THANK YOU, THANK YOU - for reviewing... I am so glad you liked Plan Cee! You have no idea how much it means to me you described the book as chick lit at it's finest! I love it too - huge compliment! Hilary sure knows how to tell a story, and you are so right, she is a wonderful person! I've not read her before, but she does sound like a great read. I love books that I don't want to end, and it usually takes me forever to read them for that reason. I hardly get to read anything but "cat books" anymore, but this definitely sounds like one I'd like to read. Going to check it out now. Thanks for the review. The story has immediately caught me. I need to know what happened next! Great job with your review Caren! Somehow, despite all the rave reviews I keep hearing, I have not yet ready any of Hilary Grossman's books. I really should remedy that. Thank you for sharing this with us! Yes you should!!! You are most welcome! When you read them, please let me know! I read Plan Cee too. I really liked it - a lot of the story resonated with me. I have this book downloaded into my kindle just waiting to be read! I can't wait until I can find the time for it. So happy to hear that Jan! Let me know how you like it!!! Nice review. I enjoyed this book too. I will have to check out her books. I've never read any of them, but I keep hearing great things! Hmmm, that does sound intriguing!